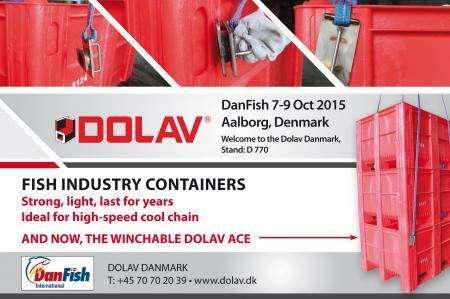 Launched at DanFish by Dolav is the new winchable Dolav Ace plastic pallet box. “Dolav plastic pallet boxes are used at every stage of the wholesale fish industry as we can show visitors to the Dolav Stand D 770. A major company now uses Dolavs in the high-speed cold chain instead of insulated boxes. The main reason is the Dolav Ace is lower cost, lower tare weight and so has a higher payload. Additionally, the Dolav wall does not have internal insulation material so the Dolav cannot be contaminated or made heavier with water getting in,” he said. The Ace is 740 or 540 or 440 mm high on a 1200 x 1000 base. At 740 mm high the Ace takes 620 litres, 900 KG and max stack load of 5,000 KG. Dolav Danmark is on stand D 770.